I have written previously about issues involving the rights of photographers. Those posts can be seen here and here. I am at least pleased to say that this was not the work of the USA.....though it certainly could well have been. Nope, this one is from England. Check it out on Carol Wright's Photo Attorney blog......the story is here. The most absurd part of it is that, as Attorney Wright points out, ".......in days where most everyone has a cell phone camera, it's ironic that the larger your camera, the more likely that you'll be hassled. Terrorists are prone to be more discreet." 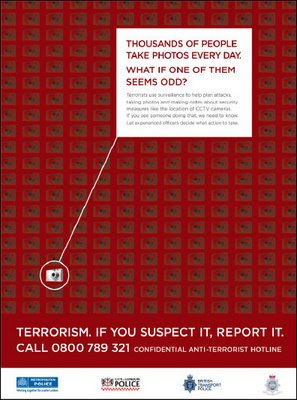 I am all for stopping terrorists, but this has to be about the most ineffective method around and simply encourages others others to, once again, violate the rights that one has to simply make photographs!